Samba Vallarta Nuevo Vallarta features hacienda-style architecture and was recently Nominated for Condé Nast Traveler Readers’ Choice Awards 2019. This Nayarit hotel, nestled amongst coconut trees, palms and bougainvillea, is a tropical oasis and the perfect all-inclusive resort for those wanting to vacation away from it all. Samba Vallarta Nuevo Vallarta is an all-inclusive resort hotel that features over 180 spacious rooms, 3 interconnected pools, 3 restaurants, and 3 bars. Additional amenities include complimentary WiFi in public areas and rooms. The Samba Vallarta keeps guests entertained with nightly programs and theme nights, non-motorized water sports like kayaks and boogie boards, a gym, billiards, and more. For families with children there is the kids’ playground, plus Kids Club, and outdoor children’s films. Additional activities for all ages include table tennis, beach volleyball, shuffleboard, darts, and football. Samba Vallarta Nuevo Vallarta is just one of Emporio Hotels & Resorts’ many fine Mexico hotels. For more than 60 years this hotel brand has maintained international standards with luxurious spaces designed to help guests relax and enjoy the best Mexico vacation ever. Hotel Samba Vallarta Nuevo Vallarta recently made the Top 10 list for one of the 10 Best Pools in the Nayarit! 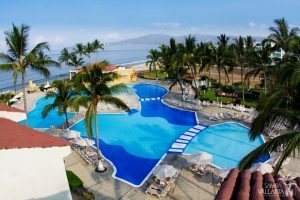 Beach: Long, sandy, swimmable beach in the heart of Nuevo Vallarta, with panoramic Banderas Bay views. Accommodations at the resort consist of 183 oversize rooms or suites spread throughout one four-story building with either garden, pool or ocean view. All the rooms have individually controlled air conditioning and feature marble tiled floors, bathrooms with tub or shower, direct-dial telephone, mini refrigerator (only suites), remote-controlled television with Spanish and English speaking channels. Cribs and rollaway beds are available upon request. Superior Rooms: Spacious room with marble tiled floors feature one king-size bed or two double-beds, large bathroom with bathtub or shower, remote-controlled television with satellite reception with Spanish and English speaking channels, telephone direct-dial long distance, individual air conditioning controls, and a dining table for two. Superior Rooms W/Private Balcony: These rooms feature one king or two double-beds, a large bathroom with bathtub, marble tiled floors, remote-controlled television with satellite reception and Spanish and English speaking channels, telephone direct-dial long distance, individual air conditioning controls, and a dining table for two. Suites W/Private Balcony: These magnificently spacious rooms have marble tiled floors, one king-size or two double-beds, plus sofa bed, one and a half bathrooms (one with a bathtub), partial kitchenette with microwave and mini-fridge, remote-controlled television with satellite reception and Spanish and English speaking channels, telephone direct-dial long distance, individual air conditioning controls, separate dining area with dining table and chairs for four, private safe, iron, ironing board, and a hair dryer. La Hacienda International fare, served buffet-style for breakfast, lunch, dinner, and midnight snacks. Recently renovated Venezia Italian served a la carte; open for dinner only, with reservations required. Mexican Grill International fare for dinner; reservations for dinner required. Snacks also available during the day. Pools: 3 beautiful interconnecting pools which include one for activities and one for children. Cristal Open bar in lobby, with range of national and international liquor available; also serves juices and soft drinks. Ambar Open bar in theatre, with range of national and international liquor available; also serves juices and soft drinks. Mexicano Open bar by the pool, with range of national and international liquor available; also serves juices and soft drinks.